There once was a food truck – an amazing wonderful food truck – located at NATY, or North Austin Trailer Yard that served the most delicious Ramen you could ever imagine. 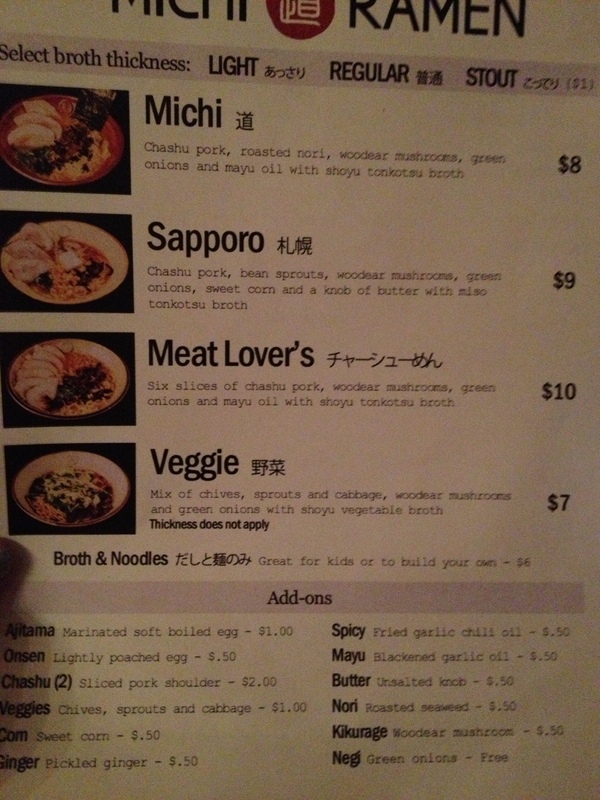 Michi Ramen. Their twitter feed consisted of only numbers, for they could only serve a limited number of bowls each day, and used their tweets as a count down. And they inevitably sold out every single lunch and dinner. This ramen was like nothing you’ve ever had before, with broth cooked for days with pork flesh and bone to ensure a richness that couldn’t be matched. Life changing goodness, body fortifying. And almost literally good for your soul. …Okay, I may be exaggerating, but only a little. Any way, one day Michi couldn’t keep up with its fans demands and closed shop (or truck as it were) to find and establish a brick and mortar location. We had to go months without ramen, settling on Ramen Tatsu-Ya…which I should really do a Gastro Graze on (while it IS good, it’s a bit over hyped and it ain’t no Michi). 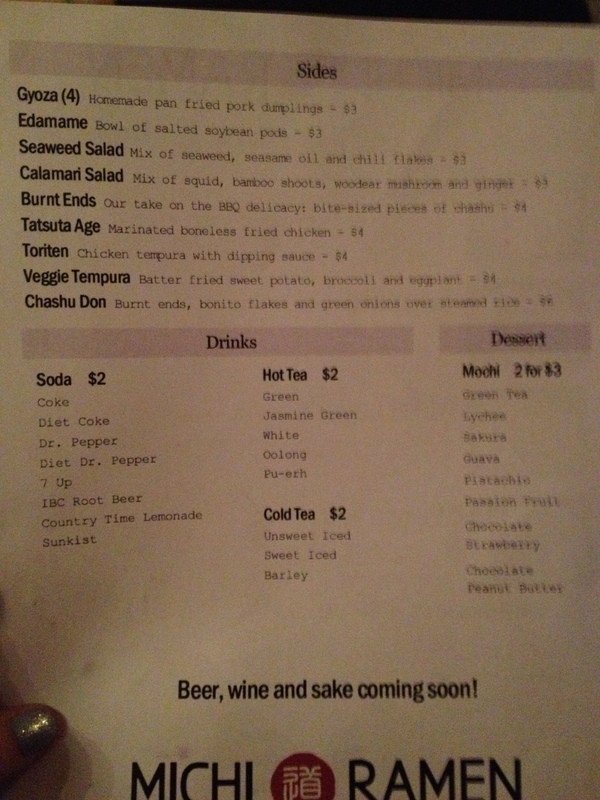 But finally our patience paid off: Michi Ramen restaurant is now a go! Located on North Lamar in the old Afin location (6519 N. Lamar, ATX, 78752), Michi’s space is open and bright. They don’t have a liquor license just yet, but they’re working on it and in the mean time it’s BYOB. Having a larger truck means that they get to have more food offerings, including numerous sides or little bites and dessert on top of their four different styles of ramen, three different broth thicknesses, and a plethora of toppings available. I apologize for the bit of blurriness in these photos. We order bowls of the Michi in both Light and Stout, the Sapporo in regular with an Onsen egg, and the Veggie in regular, as well; Tatsu-Ya at this time does not offer a vegetarian option. I had had the Ajitama egg when they were a food truck and while some may be turned off by its color due to marinating, it is absolutely delicious. 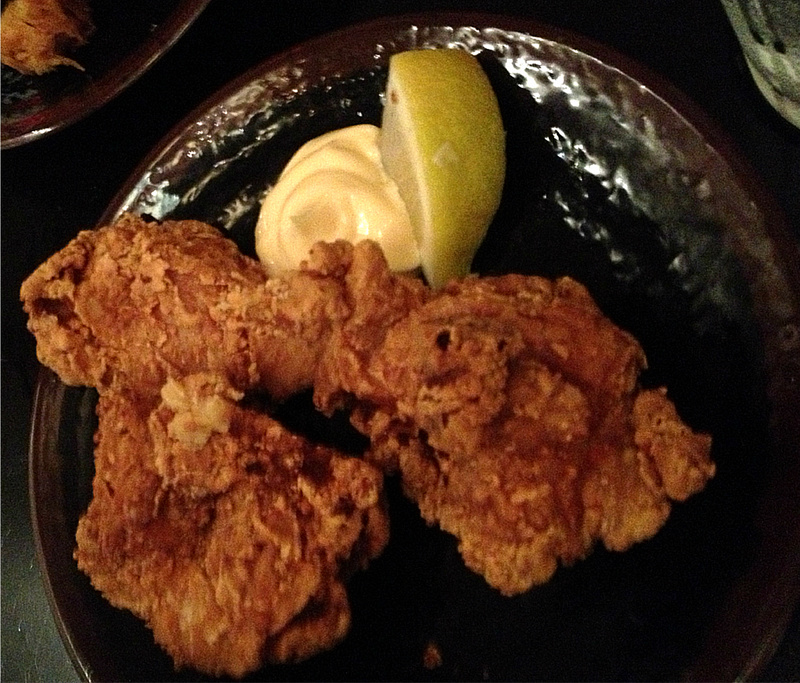 We also ordered both kinds of fried chicken, the calamari salad, the vegetable tempura, gyoza, and Burnt Ends. It was hard to get pictures of every thing, as most was devoured as soon as it hit the table. The food came out fast, was very delicious and affordable, the atmosphere was baby friendly, though the crowd was primarily people aged about 27-42 without children. Sapporo with regular broth and an onsen egg mixed in. For $7-10 you get this steaming hot, seemingly bottomless bowl of ramen, with perfectly tender noodles. My Sapporo came with corn and scallions, as well as three huge slices of pork, mushrooms, beans sprouts, and so much goodness. I paid the extra 50 cents for an onsen egg which I immediately mixed into the broth, making it even richer. 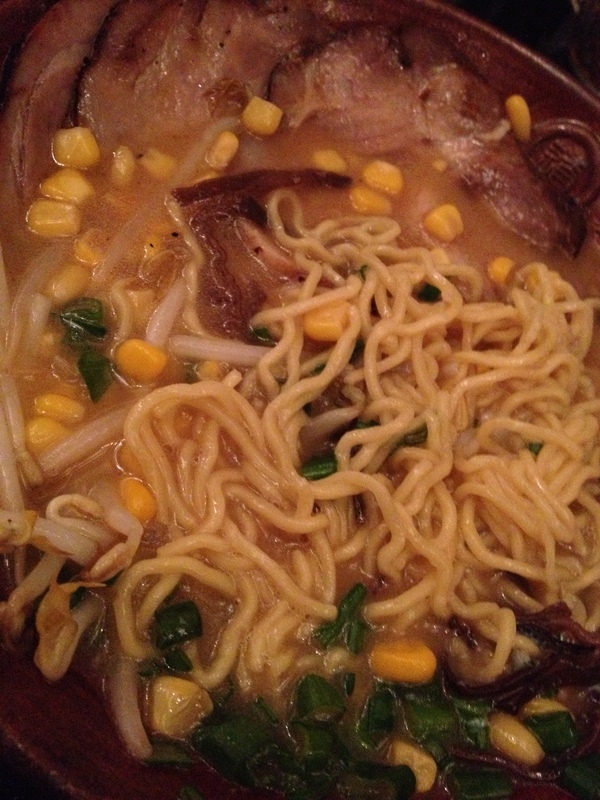 I found the Sapporo to be a little sweet, though not in a bad way, and we attributed that to the fresh corn that a welcome firmness in texture to the soft, but not soggy noodles. 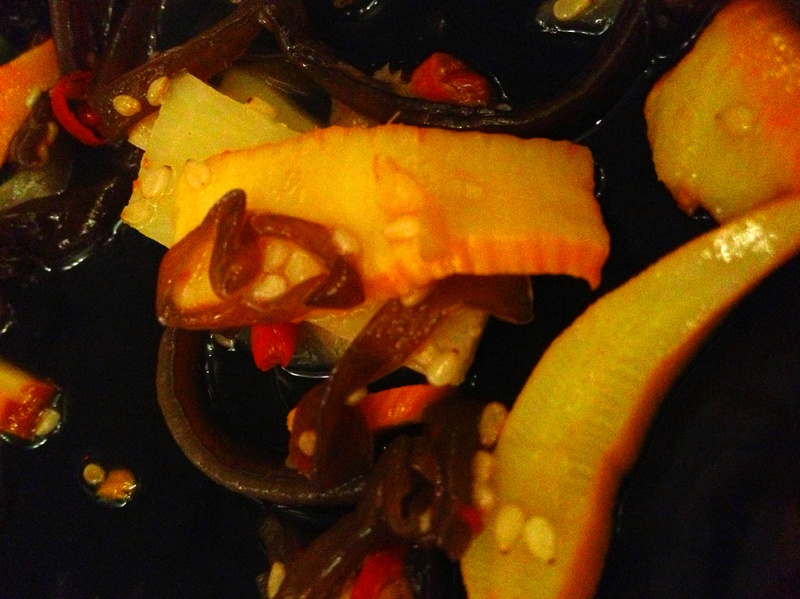 The calamari salad was both bright visually and in flavor, without any hint of fishiness or chewy texture. It was, in short, refreshing, an excellent palate cleanser, and even those at the table that don’t like this sort of thing found it tasty! The Burnt Ends are fatty, tasty, crispy little bites of pork, smokey and sweet. There’s no picture because we were close to wrestling one another for the last bite, let alone anyone pausing to snap a shot. Our table ordered both offerings of fried chicken the Tatsuya Age and Toriten. Both were very good, large, juicy, white meat chunks, and large portions for the $4 they charged. While there’s no picture of the Toriten (a tempura batter fried chicken) I think that was my favorite, though the Tatsuya was very good as well with the lemon and bright dipping sauce. There was something delightfully Texan about the Tasuya, but it wouldn’t be something that would be a necessity on their menu. Both would be great for pickier eaters or children. The vegetable tempura and Gyoza were also good. Nothing amazing. Simply easy staples that should always be good – how could you mess them up? Finally: Dessert. 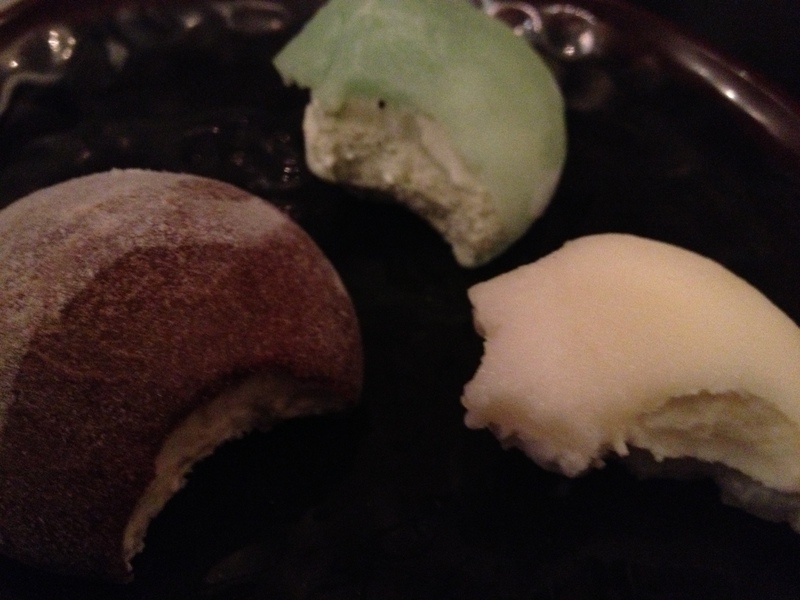 Michi offers ten flavors of Mochi Ice cream. While it’s not hard to find mochi ice cream even in grocery stores now a days, they did have some flavors I hadn’t tried before. And while we all shared Lychee, Pistachio, and the Chocolate Peanut butter flavors, at $3 for 2, and so many side plates for under $5 I’ll be hard pressed to not stop in regularly for “a quick bite” of so many of their offerings. In short, I recommended the trailer without hesitation until it closed. I now highly recommend the restaurant as well. For families, for dinner, for a date, for lunch, for dessert (and BYO saki), for foodies, for punks, for whomever. Michi has excellent ramen for a variety of tastes, excellent and affordable sides, great though stark atmosphere, and I hope they’ll be a new constant on the Austin restaurant scene. This entry was posted in Comedy, Entertainment, Gastro Graze, Humor, Recipes and tagged asian, austin, cheap, comfort, date, dinner, food truck, fried chicken, japanese, kids, lunch, michi, mochi, natty, north austin trailer yard, quick, ramen, review, trailer, vegetarian.